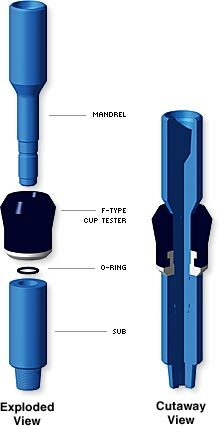 Packard International’s F-type cup tester assemblies are designed to be attached to the drill string and lowered into the casing beneath the wellhead to pressure test the blowout preventer stack and the wellhead. 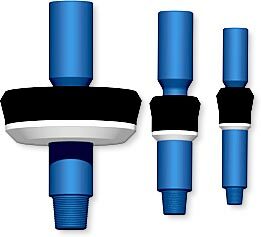 The cup tester assemblies are rated to the API standard mill test pressure for the casing sizes up to 10,000 psi. Special reinforcing can be offered on all cup sizes and casing weight ranges to hold up to 15,000 psi. Packard International cup tester assemblies are provided with internal flush connections. Other connections are available at an additional cost. the requirements of any job. For complete instructions and specifications, please phone 281-399-8771, e-mail support@packardint.com, or click the link below to download a PDF. Mandrel Size (in.) Mandrel Part No. Only the most popular sizes are shown above. Please contact Packard International for additional sizes.